If you’re thinking about remodeling your bathroom, it can be an overwhelming process and many don’t even know where to start. The first thing you need to decide is what exactly you want to do to your bathroom – replace just the bathtub? Convert the tub into a shower? Tear out everything and start fresh? Answering these questions will make it easier when you start looking for a contractor, because you’ll know exactly what services you require. No matter what your bathroom remodeling idea is – New York Sash can do it all! If you just want to replace your bathtub we can do that with our Acrylic Bathliner Systems. The concept is simple and the result is outstanding. A highly trained New York Sash technician installs a new tub and wall system over your old existing bathtub and walls without disturbing plumbing, floors, or walls! Plus, the acrylic surface will not chip, crack, or peel and is extremely easy to clean and maintain. If you answered yes to converting your tub into a shower, we also do tub-to-shower conversions. We’ll change your old bathtub into an easy access extra-large shower, with full accessibility options including grab bars, walk-thru inserts, seated shower bases and folding seats! 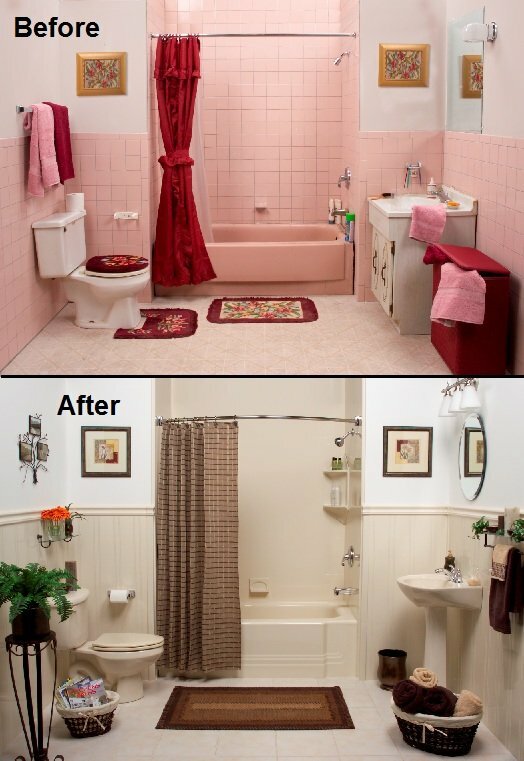 Or if you decided on a complete bathroom tear-out – we can do that too! Plus, all of a bathroom options are completely customizable with our wall options, wall colors and accessories! You can also use our interactive Build Your Bath software to see how your bathroom could look after remodeling with our acrylic bath systems! Call us at (315) 624-7344 or stop by our Idea and Design Center at 349 Oriskany Boulevard in Whitesboro to learn more about how we can help create the bathroom you’ve always wanted! Need some more bathroom ideas? Check out our “Bathroom Ideas” board on Pinterest! PreviousPrevious post:Porch Repair in Weedsport, NYNextNext post:How Do You Clean Vinyl Siding? Great points! There are so many things you can do to spruce up your bathroom. Hiring a qualified contractor that can help your put the finishing touches on your ideas is always the best choice. Really a great points to read.The design of your bathroom dictates its overall mood and energy. Tiled walls give it a clean, modern look, while certain colors and stylish accents can make it more inviting. Pingback: Build Your Bathroom Online!